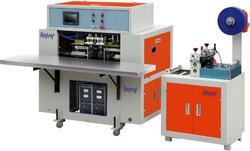 Offering you a complete choice of products which include ultrasonic handle spot welding machine, automatic handle loop making machine, handle loop making machine, non woven handle loop making machine, non woven handle loop machine and automatic handle loop machine. We are an eminent entity engaged in offering an extensive range of quality assured Ultrasonic Handle Spot Welding Machine. It’s a Cost competitive solution with moderate volumes and best available option in the market without making any compromise with quality and efficiency even such a lowest cost.Owing to features like durability and easy installation, the offered machine is extensively used for welding purpose. A team of our adept professionals, with hard-earned experience manufacture the offered machine using high grade raw material. 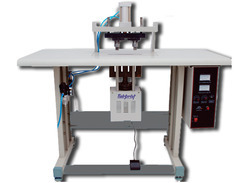 The offered machine is available with us in various sizes, designs and other related specifications. Power Supply 220 v / 50 Hz / 1 Ph. 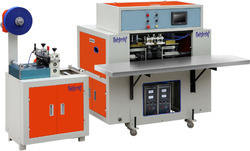 Our domain expertise has enabled us to come up with an excellent collection of Automatic Handle Loop Making Machine. These machines use two inches wide strip of non-woven fabric, which folds the fabric uniformly from both the sides and does ultrasonic welding at the center of the strip. This further ensures good quality & smooth handling of the bags. FAIRPRINT Automatic Handle Loop Making Machine is a Breakthru' Innovative Design to deliver Latent needs of Global Consumers for mass production efficiently at very competitive running cost. FAIRPRINT 'an ideal for best quality jobs' is highly productive Automatic Handle Loop Making Machine. This uses 2” wide strip of Non-Woven Fabric which folds the fabric uniformly from both the sides and does ultrasonic welding at the centre of the strip thus ensuring good quality smooth handling. Superior Technology Control Panel with Touch Screen allows easy customer interface resulting in good quality consistent output. FAIRPRINT provides complete solution for Non-Woven Handle Loop Making while ensuring Robust, Reliable Durable products and provides Best Value for Money. FAIRPRINT Non Woven Handle Loop Making Machine is a Breakthru' Innovative Design to deliver Latent needs of Global Consumers for mass production efficiently at very competitive running cost. FAIRPRINT 'an ideal for best quality jobs' is highly productive Non Woven Handle Loop Making Machine. FAIRPRINT Non Woven Handle Loop Machine is a Breakthru' Innovative Design to deliver Latent needs of Global Consumers for mass production efficiently at very competitive running cost. FAIRPRINT 'an ideal for best quality jobs' is highly productive Non Woven Handle Loop Machine. FAIRPRINT Automatic Handle Loop Machine is a Breakthru' Innovative Design to deliver Latent needs of Global Consumers for mass production efficiently at very competitive running cost. 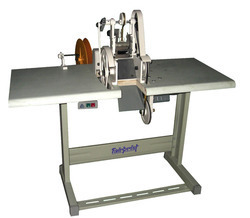 FAIRPRINT 'an ideal for best quality jobs' is highly productive Automatic Handle Loop Machine. FAIRPRINT Automatic Non Woven Handle Loop Machine is a Breakthru' Innovative Design to deliver Latent needs of Global Consumers for mass production efficiently at very competitive running cost. FAIRPRINT 'an ideal for best quality jobs' is highly productive Automatic Non Woven Handle Loop Machine. FAIRPRINT Automatic Handle Loop Pasting Machine is a Breakthru' Innovative Design to deliver Latent needs of Global Consumers for mass production efficiently at very competitive running cost. FAIRPRINT 'an ideal for best quality jobs' is highly productive Automatic Handle Loop Pasting Machine. Double Spot Non Woven Handle Loop Machine by FAIRPRINT is a best Solution for Handle Loop pasting on the Non-Woven Bags. It’s a Cost competitive solution with moderate volumes and best available option in the market without making any compromise with quality and efficiency even such a lowest cost. Compact design, user friendly operation and strength full pasting makes it most demanding machine in bag making segment. 220v / 50Hz / 1 Ph. Single Spot Non Woven Handle Loop Machine by FAIRPRINT is a best Solution for Handle Loop pasting on the Non-Woven Bags. It’s a Cost competitive solution with moderate volumes and best available option in the market without making any compromise with quality and efficiency even such a lowest cost. 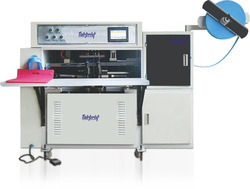 Manual Handle Loop Pasting Machine by FAIRPRINT is a best Solution for Handle Loop pasting on the Non-Woven Bags. It’s a Cost competitive solution with moderate volumes and best available option in the market without making any compromise with quality and efficiency even such a lowest cost. Non Woven Handle Loop Pasting Machine by FAIRPRINT is a best Solution for Handle Loop pasting on the Non-Woven Bags. It’s a Cost competitive solution with moderate volumes and best available option in the market without making any compromise with quality and efficiency even such a lowest cost. 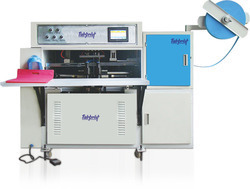 Ultrasonic Handle Loop Pasting Machine by FAIRPRINT is a best Solution for Handle Loop pasting on the Non-Woven Bags. It’s a Cost competitive solution with moderate volumes and best available option in the market without making any compromise with quality and efficiency even such a lowest cost. 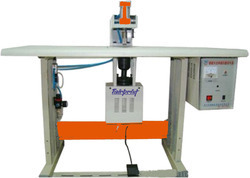 Handle Cutting Machine for Handle-Loop by FAIRPRINT is a best Solution for Handle Loop cutting of the Non-Woven rolls. It’s a Cost competitive solution with moderate volumes and best available option in the market without making any compromise with quality and efficiency even such a lowest cost. Compact design, user friendly operation and various cutting lengths option makes it most demanding machine in bag making segment. 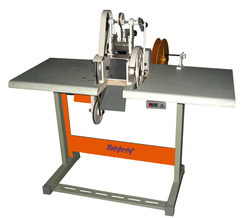 Handle Loop Cutting Machine for Handle-Loop by FAIRPRINT is a best Solution for Handle Loop cutting of the Non-Woven rolls. It’s a Cost competitive solution with moderate volumes and best available option in the market without making any compromise with quality and efficiency even such a lowest cost. Non Woven Handle Cutting Machine for Handle-Loop by FAIRPRINT is a best Solution for Handle Loop cutting of the Non-Woven rolls. It’s a Cost competitive solution with moderate volumes and best available option in the market without making any compromise with quality and efficiency even such a lowest cost.